In the 1880s Burton on Trent was a prosperous town, it had been famous for its high quality beers for hundreds of years but during the 19th century thanks to the development of the railways, the number and size of the breweries grew. The breweries used the railway not only to supply the raw materials necessary for brewing (hops and barley for the beer, coal for the machines and oak for the barrels) but also to transport the finished product to depots and ports around the county. 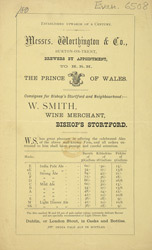 This leaflet is advertising beer produced by ‘Messers Worthing & Co.’.